Four years after the land was donated, construction of Chihowa Okla UMC at Durant has started. This is a new church in the Oklahoma Indian Missionary Conference. In late September, two teams of volunteers organized by First Broadstreet UMC in Kingsport, Tenn., arrived in Oklahoma. During two weeks of work, they completed the building’s walls along with the roof. The teams were made up of about 40 people from several states, including Tennessee, Louisiana, Colorado, Arkansas, Maryland, and Texas. Danny Howe, the Volunteers In Mission project director from First Broadstreet, said the teams worked hard. The church at Durant is one of about 10 projects the Tennessee congregation has completed in the OIMC, mostly in the Southeast Region. OIMC Superintendent David Wilson said he was amazed to see the team’s organization in its work and the joy the volunteers exhibited while building. "They were an amazing group, made up of people of all ages and professions," he said. "They are truly a group that lived out the gospel of Jesus Christ by the work and service they provided for Chihowa Okla."
Rev. Dr. Wilson commended the laity at the local level who were the VIM project leaders. "It is a reminder of the importance and service of laity in the local church." 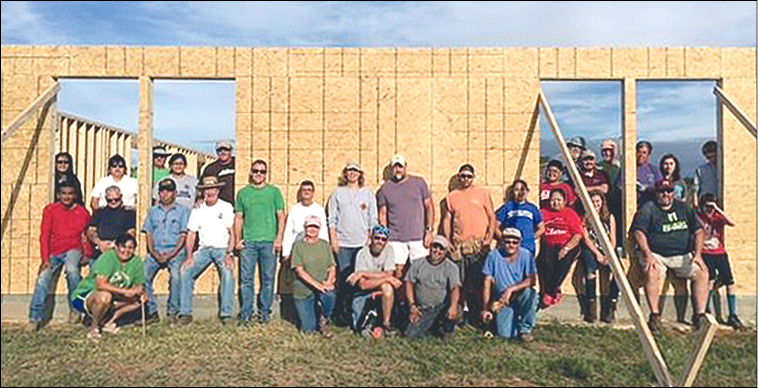 Chihowa Okla UMC members are excited about the 6,500-square-foot building that is taking shape on North First Street in Durant, less than a mile from Southeastern Oklahoma State University. Durant is the headquarters of the Choctaw Nation. The Choctaw Nation donated the land four years ago, under former Chief Greg Pyle. After consultation work with the City of Durant, permits were cleared. The work will progress over the coming months. In the Choctaw language, the church name means "God’s people." It was chartered in 2010 and was the first church in the OIMC Southeast Region to charter in 30 years, according to OIMC Superintendent David Wilson. Chihowa Okla UMC currently meets at the Choctaw Nation Community Center in Durant, with Sunday worship at 11 a.m., plus Sunday School and Wednesday evening ministries, according to the website. Volunteers still are needed, especially professionals in the building trades. For more information, contact Josephine Deere at the OIMC office, 405-632-2006. 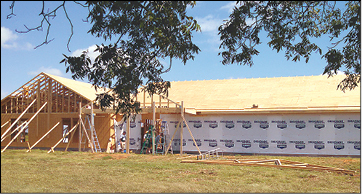 In Durant, the building that will house Chihowa Okla UMC is taking shape. A VIM team sponsored by a Tennessee church assembled the walls and installed roof trusses at the site earlier this fall. More volunteer help is welcomed.